There’s another casualty on network TV. CBS’ military drama, The Unit, has been cancelled after four seasons on the air. The Unit revolves around an elite military unit and their civilian loved ones. The series features the talents of Dennis Haysbert, Regina Taylor, Audrey Marie Anderson, Robert Patrick, Max Martini, Abby Brammell, Michael Irby, Scott Foley, Demore Barnes, Alyssa Shafer, Danielle Hanratty, Kavita Patil, and Rebecca Pidgeon. 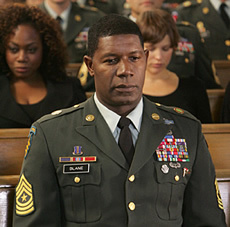 Created by acclaimed director and writer David Mamet, the series debuted in mid-season 2006. An average audience of 15.5 million viewers ensured a second season for the drama but year two didn’t go as well, attracting 11.1 million viewers. The show has continued to decline in the ensuing years and season four has averaged an audience of 9.67 million. Though the overall viewership isn’t too low, the series does skew older. The average age of The Unit’s viewership is about 55. The series has been “on the bubble” for awhile and many took it as a bad sign when showrunner Shawn Ryan signed on to helm FOX’s Lie to Me. Ryan however maintained that he would continue on both shows if The Unit was renewed. He’d previously performed double duty while working concurrently on The Unit and The Shield. Should The Unit have been cancelled? Like most of the networks’ actions these days, the decision to renew or cancel came down to finances. CBS had asked for all of its shows to reduce their budgets. The Unit is actually already cheaper to produce than it looks. Shot primarily in Southern California, it costs less than $3 million per episode to produce. That’s about half as expensive as other primetime dramas. In an age when the networks and studios have to watch every dollar, they’ve all been favoring renewing shows that are created by sister or in-house production companies. Since 20th Century Fox TV produces the show, the network wouldn’t benefit if the show went into syndication. The Unit shouldn’t have been cancelled at all.. It was a great program and I was very upset when it ended. The unit was, bcc and is a good show! But I must say the IDIOT in charge of the camera work needs to go back to school. I shouldn’t have to get sea sick while watching my TV! IF think back on other shows that were cancelled, like CSI NY, you’ll remember the same stupidity in camera work. So the question stupidity, or cost cuting. Please bring back the show cuz we have been learning quiet a lot from it. We here in Africa don’t get shows like this and we get a lot knowledge which changes our perceptions about certain things so please bring it back. No way that show should’ve been cancelled. I watched every episode and they were all extremely good! Who else is beng watching The Unit in 2018 !!!! I am. One of the very very few TV series with good writing and acting. Very creative. The Unit was really interesting and looked forward to each upcoming episode. Most of what is left on TV is either boring documentaries, or silly crap passing as programming. I will just have do to without. I am. It’s a great show with talented actors who make it believable and it covers a multitude of real life issues that affect our service members and their families. Through the years, I’ve seen CBS cancel a lot of great shows that just leave the viewers/fans hanging. I am! I love it. Still watching, watch the entire series once every winter. It’s like a fine wine, just gets better with age! This is 2019 & I just got done watching the unit on Hulu. I did watch it when it was on TV and I was very disappointed when it got cancelled! This was a great show! I wish they would have a series finale 2hr episode of these shows they like to cancel! Give everyone a bit of closure. This show is so much better than Seal Team which seems to be the same stuff in each episode. Wife and I liked this show. I FIND IT HARD TO BELIEVE THEY HAD LOW RATINGS. EVERYONE I KNOW WATCHED IT. I am a retired Veteran, this series had a lot of issues covered that was “real world”, soldiers dealing with post traumatic stress, difficulty with marriage and personal life, dealing with loss of comrades. To me it helped with stress relief. I wish they would either bring it back or start a similar series. CBS was a fool to cancel.this show . unfortunately the good shows get cancelled and we are left with pathemis trash to watch. Cant believe they cancelled this…what an amazing show. Nothing even comes close these days. This show was a joke. I have been watching and they are in charge of a sub. In a previous show they talked a guy into how to fly a jet. Episode after episode illustrates that Hollywood has no idea what officers and NCOs so. No rank insignia on people in uniform and they thought that Rangers are superior to Green Berets or SEALS. Just a joke in my humble opinion.